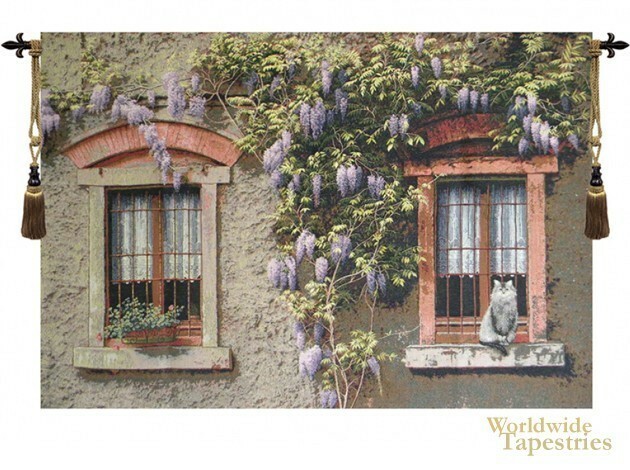 In Windows with Wisteria tapestry we see a pair of windows adorned with wisteria and a cat perched. This cityscape tapestry shows life in the city or town, with the coming together of man-made and natural elements, and the purple wisteria blends beautifully with the stone walls and red and beige windows. This Windows with Wisteria Barconi tapestry is backed with a lining and a tunnel for easy hanging. Note: tapestry rods and tassels, where pictured, are not included in the price. Dimensions: W 53" x H 33"